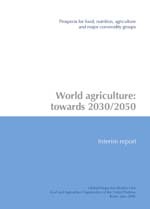 This interim report presents an update, revision and extension to 2050 of Chapters 2 and 3 of the FAO Study World agriculture: towards 2015/2030, an FAO Perspective, published in 2003 (Bruinsma, 2003). It is mainly meant to disseminate interim results and to solicit comments, as an intermediate step in the preparation of a more complete report. Acknowledgement: This report was prepared by Nikos Alexandratos in collaboration with Jelle Bruinsma, Gerold Bödeker, Josef Schmidhuber, Sumiter Broca, Prakash Shetty and Maria Grazia Ottaviani. In the presentation of statistical material, countries are, where appropriate, aggregated in the following main economic groupings: Developed countries (including the developed market economies or ‘Industrial countries’ and the Transition countries) and Developing countries. The designation developed and developing economies is intended for statistical convenience and does not necessarily express a judgement about the stage of development reached by a particular country.